Official synopsis: "After winning the brutal Hunger Games, Katniss Everdeen returns to her district, hoping for a peaceful future. But Katniss starts to hear rumours of a deadly rebellion against the Capitol. A rebellion that she and Peeta have helped to create. As Katniss and Peeta are forced to visit the districts on the Capitol's cruel Victory Tour, the stakes are higher than ever. Unless Katniss and Peeta can convince the world that they are still lost in their love for each other, the consequences will be horrifying... The terrifying sequel to The Hunger Games." Lordy lordy lordy. I have just finished Catching Fire and I really do not know where to begin. But I will promise this review will be shorter than the novel I wrote for The Hunger Games! Just over a week ago I revieved a package from Scholastic, and The Hunger Games and it's sequel, Catching Fire were in there. I'd wanted to read the series before, but never got around to it, and the idea of sending children into an arena to fight to the death for entertainment purposes detered me. But when I revieved the copies, I knew that I had to read them. I read The Hunger Games and have fallen in love. It's become my latest obsession and I could not wait to read Catching Fire. Luckily, I didn't have to wait as my copy was ready and waiting! There have been uprisings across Panem. And it appears that Katniss is the image of the rebels. She is the one they look up to. And President Snow is having none of it. He wants Katniss to put an end to it. Pesident Snow is one of the most vile, hateful character I have ever had the misfortune of reading, but at the same time I can't get enough of him. He's so repulsive and yet fascinating.Rather like the premise of the trilogy! It's a little slow to kick start, with the majority of the action taking place in the last two to three hundred pages. But from the very beginning it has a special feel about it. 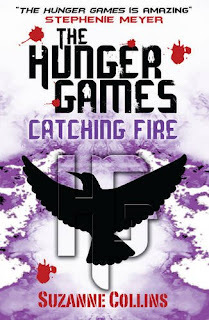 I didn't get bored at all, the story just wasn't as instant as it was in The Hunger Games. Old characters return. And new are introduced. It's the year of the Quarter Quells - which take place every 25 years. Another mockery of the inhabitants of the districts that the Capitol rule them. But this year, things are a little different. Only past victors are eligible. 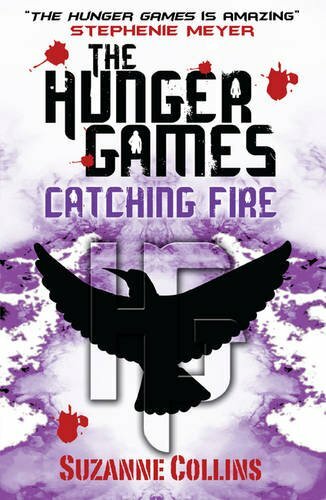 Thrust back into the Hunger Games again, Katniss knows that this time she cannot survive, and plans to help Peeta win the games. I loved meeting all the past victors. Some of them are really good, interesting, even funny characters and it's sad that we don't get to see more of them than we do. I think it is my favourite of the two. It's set the scene for Mockingjay beautifully. THAT CLIFFHANGER!!! SERIOUSLY! If you've read it, you'll know what I mean. I actually shouted "It can't end there!". I am so excited for the finale and the next few weeks are going to be pure hell. Whatever you do, make sure you read this trilogy. You've got time to catch up now in time for the 25th August release date! Hurry! My thanks to Steven at Scholastic for my copy! How much am I dying to read Mockingjay now? You too, sounds like it!